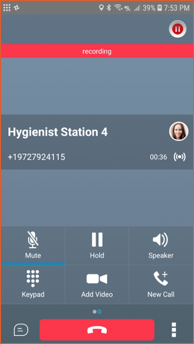 If you have call recording configured on your seat, the client provides options to control your call recording. You will see a recording status icon in the upper right corner during active calls. If your recording options are set to allow you to start and stop recordings, you’re recording does not start automatically. To start your recording, touch the call recording icon. Once recording has started, a red bar will appear indicating you have an ongoing call recording. Once recording has started, the icon changes to allow you to pause recording. This allows you to pause a recording when you are about to collect sensitive information. When you are ready to begin recording again, touch the recording icon to add on to your current recording. When you end a call, your recording will end automatically.